Although the topic of the Gold Standard often comes up in economic discussions, their actual operation is less well understood. This article explains how a theoretical model of a Gold Standard works, as implemented by stock-flow consistent (SFC) models. This is a unedited draft of a section of an upcoming book that describes how to use the Python sfc_models framework. Before discussing the code structure of multi-currency models, we will examine the economics behind the framework that is implemented in Version 1.0 of sfc_models – the Gold Standard. However, free-floating currencies are harder to model than a fixed currency regime within the sfc_models framework, as we need a mechanism to determine the price level of currencies. Doing so would require an extension to the equation solver, and this development was pushed to a version beyond 1.0. As such, this book only explains the implementation of the Gold Standard. One of the difficulties of discussing the Gold Standard is that there were a number of regimes that are loosely referred to as a “Gold Standard.” Furthermore, the idea is politically loaded, and a great many people view the Gold Standard as being “gold is money.” However, this is not how the historical regimes, such as the Bretton Woods system, acted in practice. 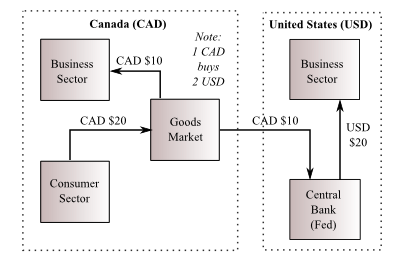 The modelling framework attempts to model the trade-offs faced by policymakers in systems like the historical Bretton Woods system. The description here follows the description of model OPEN from Chapter 6 of Godley and Lavoie’s Monetary Economics. We can interpret the results produced by sfc_models using the description here as well. However, the modelling strategy pursued by sfc_models is more complicated, as it is designed to be extensible towards a free-floating currency regime. Central banks buy or sell gold in order to balance net flows in currencies. Currency values are fixed (presumably by the central banks). The latter two assumptions are not easily relaxed; doing so would require a new equation solution technique. We can interpret the latter two assumptions as central banks requiring all other entities in the economy to use them as an intermediary for foreign exchange transactions. This is illustrated in the following example. Imagine that Canada (currency code CAD) and the United States (currency code USD) follow the Gold Standard. We will now see the flow of goods and money that result from Canada importing goods from the United States. 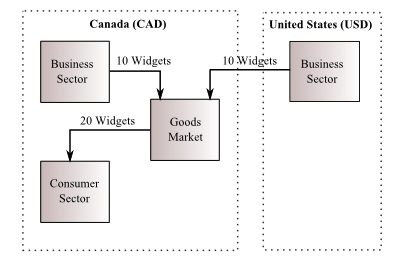 The figure above shows the flow of real goods. The Canadian consumer sector consumes 20 widgets, 10 of which are produced by the domestic business sector; the remaining 10 are imported from the United States. Such a flow of real goods would happen regardless of the currency regime. The differences of this hypothetical Gold Standard regime from the current free-floating regime appear in the figure above. The governments involved impose capital controls, and private sector entities are not allowed to hold foreign currency financial assets. Instead of the “Goods Market” paying the Business Sector directly (as it does the Canadian business sector), it sends the CAD $10 to the Central Bank in the United States (the Federal Reserve). The governments in question are holding the exchange rate at 2 USD = 1 CAD, so that the 10 CAD is equivalent to USD $20, which the central bank sends on to the American business sector. This outcome is extremely convenient for the sfc_models framework, as it preserves the fact that all cash flows received by sectors within the economy remain in the local currency of the country (the case of the central bank appears to be an exception, this is discussed next). This means that our accounting remains straightforward, as they are all in the same currency base. The problem that remains is the situation of the U.S. central bank. It is now holding CAD $10. In the real world, many developing central banks are in this position; they usually just hold the foreign currency as currency reserves. This possibility is not supported by the built-in class objects of Version 1.0, but such functionality would easily be added. We assume that memories of the War of 1812 remain fresh in this hypothetical world, and neither the Canadian nor the American government trust each other enough to lend the other money (which holding financial reserve assets would entail). Instead, the governments demand that imbalances in foreign exchange be settled with gold. This is depicted in the figure above, which shows the final transactions that close the loop created by the imports of widgets. The Canadian dollars are shipped back the Canadian central bank (the Bank of Canada), in exchange for CAD $10 worth of gold. Once this transaction is completed, we return to a situation where all economic sectors (including central banks) only hold domestic currency financial assets on their balance sheets at the end of the accounting period. We can now see why thinking that a Gold Standard implies that “gold is money” is incorrect. The only entities that trade gold are central banks, and only to settle net flows. No one in the private sector ever touches a gold coin or bar, or even a direct claim on gold, at any point in the trade flow cycle. As will be discussed later the linkage between gold and financial assets – including “money” – can be quite tenuous. In order to keep the diagrams tractable, only the case of imports from the United States to Canada was shown. However, so long as the United States did not have extremely stiff trade barriers, there would also be a flow of goods from the Canadian business sector to the United States. What matters for the balance in the currency market (and the net gold flows) is the net trade balance. So long as bilateral trade flows are balanced, imports and exports could be at any level without triggering gold flows. 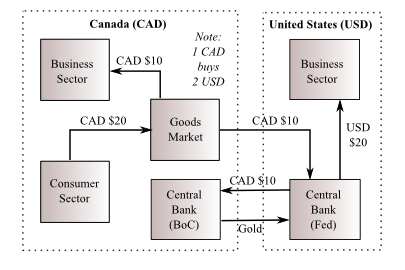 If we assumed that the financial asset flows within the diagram are money – liabilities of the central bank – there is an interesting effect buried within the diagram. In Canada, Canadian dollars are returning to the central bank. Since an entity cannot hold its own liabilities as an asset (unless it can get a particularly shady accounting firm), what happens is that those returning flows cancel out existing liabilities. In other words, the Canadian money stock shrinks by CAD$10. In the United States, USD $20 are being emitted by the central bank. This is a $20 addition to the USD money stock. Within the discussion of Godley’s and Lavoie’s Monetary Economics, the authors are able to show that the net trade in gold can be inferred by the changes to the central bank balance sheet. However, the sfc_models contains more equations specifying the net positioning of the foreign exchange markets, and the magnitude of gold sales is explicitly linked to them. The reason for the different treatment is explained in [the next section of the book], after the details of the sfc_models implementation is given. It should also be noted that the framework is not limited to bilateral trade. It is straightforward to add more countries to a model; the GoldStandardGovernment or GoldStandardCentralBank objects will also ensure that multi-lateral international flows are also balanced. Since gold is not just a financial asset, what happens if a country’s stock of gold drops below zero because of outflows? There is nothing within the system of equations to prevent such an outcome (although the framework may eventually output warning diagnostics that the model is incoherent). This is not just a modelling problem; most attempts to peg currencies ultimately fail because the assets backing the currency regime fail, or the efforts to preserve the peg prove intolerable. One means to protect gold reserves is discussed in [a later section; the method is demonstrated in this video].